We arrived in Nuwara Eliya after 12 hours spent on public transport. For such a small country it is incredible how much time one can spend travelling. We left Kataragama town at 1pm by bus and finally reached Ella around 5pm after changing the bus twice (apparently the direct bus we had been waiting for had broken down). We had a couple of hours to spend in Ella before the 7pm night mail train to Nuwara Eliya and decided to have some food, happy to be alive after another crazy bus ride, this time on winding mountain roads. The train was late and we were worried we wouldn’t reach our accommodation before midnight. A young German traveller whom we got talking to while waiting for the train, offered us his local phone to call the B&B we were staying. We told them we were delayed and the host assured us they’d wait for us. When we finally reached Nanu Oya station after a 2,5 hours journey it was 11.30pm and only one tuk tuk waiting outside. Luckily he knew where Heidi’s Homestay was and after agreeing to pay him double the cost, he dropped us outside a little quaint garden. We went in and knocked on the door but it was clear the entire house was closed and we would wake everybody up if we continued to knock. Alistair had the inspiration to go down a flight of stairs at the bottom of the garden and to find our room (which had a separate entrance) was wide open and waiting for us. The owner had even left sandwiches waiting for us. We were relieved that we didn’t have to spend the night outside (it was raining and cold) and happily fell into oblivious sleep. The next day, the host and hostess were ridiculously happy to see that we had made it to our room and served us delicious breakfast. No sooner we sat down that enter Heidi, the owners’ 7-year old beautiful and smart daughter, who instantly befriended me. We spent an hour after breakfast colouring together. I mentioned to Heidi in passing that the next day was my birthday. ‘How old will you be?’ she asked me adding stripes to a rat in her Ratatouille colouring book. ‘How old do you think?’ I asked, wanting to tease her. ’36?’ she widened her eyes. ‘My mother is 35,’ she said. ‘Almost the same age,’ I joked. ‘How old is your fiancée?’ she asked. ‘He’s 45,’ I answered earnestly. ‘That’s old!’ she couldn’t help exclaim. ‘Yes, I suppose we are old,’ I said, handing her a pink crayon for the rat’s ears. We didn’t have many options that day as the downpour was truly biblical. We only managed a short visit to the Mackwoods tea plantation before giving up on sight-seeing. 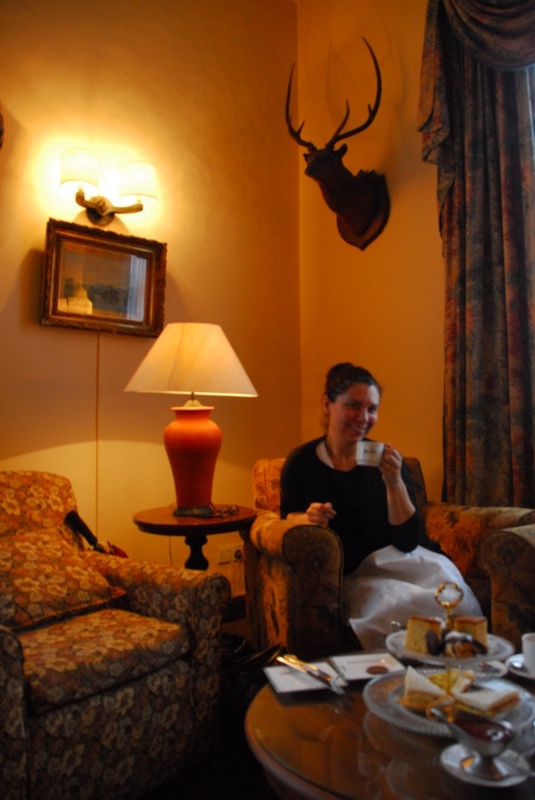 ‘Let’s have high tea at The Hill Club,’ proposed Alistair and I immediately agreed. Once inside The Hill Club, one cannot help but feel a little colonial. An old English-style building, The Hill Club’s history was visible on its walls: pictures of the royal family visits, famous people, newspaper cuttings and images of the Sri Lankan wildlife (including the elusive leopard) accompanied us to the restaurant. ‘Good afternoon, my name is Benedict and I will be looking after you today,’ said the well-groomed waiter that took us under his wing. ‘We’d like to have high tea,’ we required and Benedict withdrew like a shadow to fulfil our request in true English-butler style. He returned with a tea-pot, cups and a tiered plate full of sandwiches and cakes. ‘Have you heard of the BBC Programme Asian Provocateur, Madam?’ he asked us courteously. ‘No, I’m afraid I haven’t,’ I answered earnestly. ‘Do you have YouTube on your phone?’ asked Benedict. ‘Sure,’ I confirmed and opened the app on my phone. Soon we were watching episode 4 of Asian Provocateur (the short series in which British comedian Romesh Ranganathan visits Sri Lanka to learn about his heritage and culture), in which our very own Benedict (the man on the right) was a star. ‘Would you like to come here for dinner?’ enquired Benedict after we finished watching his performance on Asian Provocateur. ‘Why not?’ we both said. ‘It’s my birthday tomorrow so it would be nice to spend it in style,’ I added. ‘But I don’t have a jacket,’ worried Alistair who had been told men had to wear a jacket in the evenings. We left the Hill Club in good spirits. After the customary visit to the Post Office and Victoria Park we called it a day. 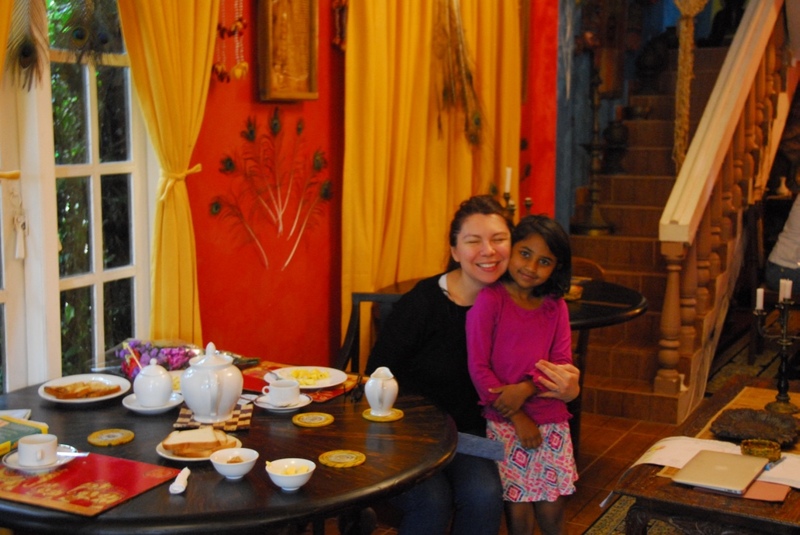 The next morning, at breakfast, Heidi approached me timidly with flowers and a birthday card. I was so moved by this lovely little girl who took notice that it was my birthday and went through the trouble to write me a card, that I hugged her enthusiastically a few more times than necessary. I told her how pretty she looked that morning, remarking that it was obvious she had made an effort with her appearance as well. In the evening we dressed up as smartly as we could in our wet clothes (everything we brought with us had become damp due to the moisture in the air) and took a tuk-tuk to The Hill Club. Heidi’s father had told the driver it was my birthday and he played me ‘Happy Birthday’ in Bob Marley style on the way to dinner. We were the first ones to arrive and Benedict took Alistair in another room to pick a jacket and a tie. When he got back I noticed he looked dapper, however at a closer inspection, there was something of Miami Vice in his oversized light-blue jacket and 80’s style shoes. ‘I look like a clown,’ he whispered in my ear as Benedict sat us down by the fire and returned with the wine menu. ‘I wanted another jacket, but Benedict wouldn’t have any other way. He turned me into a muppet,’ he joked. An hour later, we were sat down at the dinner table and, having just finished my beef steak, I noticed the room went dark and Benedict came in with two sparklers in his hands singing ‘Happy Birthday’. Was it someone else’s birthday too, I found myself thinking. But no, it was all for me. Benedict was soon standing by our table with the sparklers in his hands coming to an end looking furiously behind him at the guy with the trolley that had gotten lost somewhere in the dark. When he finally reached our table, he produced a birthday cake. I was moved and terribly entertained by the whole scene that seemed taken out from a silent movie. After two pieces of cake we realised that it was too much for us and even though we took some away for Heidi, there was still plenty of cake left. Alistair decided to go around tables and offer cake. Soon, we were the most famous two people in the Hill Club. ‘We want to have a drink somewhere else,’ Alistair told Benedict and, in great secrecy, he planted us at a table near the door in the private bar. It didn’t take long for the company of people in the private bar to notice us and introduce themselves to us. Soon, we were shaking hands with former Miss India, former Miss Sri Lanka, a famous Korean TV presenter and her husband, also known as ‘King of Korea’. Business cards were exchanged and it didn’t take long for us to realise it was a classic quid-pro-quo: having found us in the private bar, the VIPs assumed we were VIPs too and decided to make our acquaintance. We kept our mouths shut and said our goodbyes before we were found out. A few Napoleon brandys on the terrace later, we left the club in full form, not before we praised our dear host, Benedict, to his boss. Saying goodbye to ‘King of Korea’, who was secretly smoking in the car park, we left the Hill Club long after midnight. ‘This was the best birthday ever,’ I whispered into Alistair’s ear just before getting into the tuk-tuk taking us back to Heidi’s Homestay. I had no idea more fun was even possible but I was excited about our next day trip to Kandy.